Can you survive?! 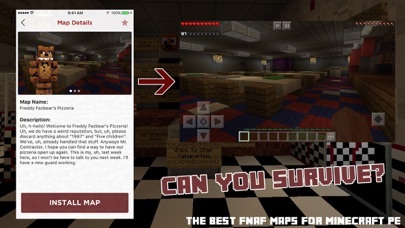 Play on the best Five Nights at Freddy's maps available for Minecraft PE! No computer is required to add them to Minecraft PE. 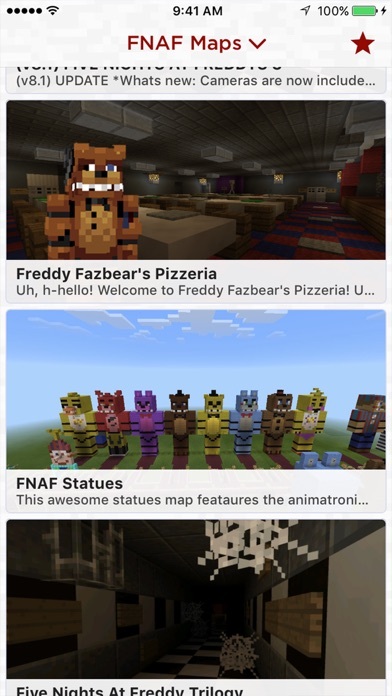 Not an official Minecraft product. Not approved by or associated with Mojang. Please note: While the app does have free content, some maps require in-app purchases to unlock. Compatibility notice: Auto install only works with iPad 3 and newer, iPad Mini 2 and newer, iPhone 5 and newer, and iPod 6 and newer. Ensure that your device is updated to the latest firmware and Minecraft PE is updated to the latest version. Skins Free for Minecraft PE - Best Skins for Pocket Edition!